Whether you're remodeling your home or building a new one, there's no better complement to your fireplace than this Empire 72 Inch Profile Wooden Mantel Shelf with Standard Trim. This beautiful and useful fireplace addition gives you everything you want in both style and function. The shelf is constructed with cabinetry-grade materials and comes to you in primed hardwood. 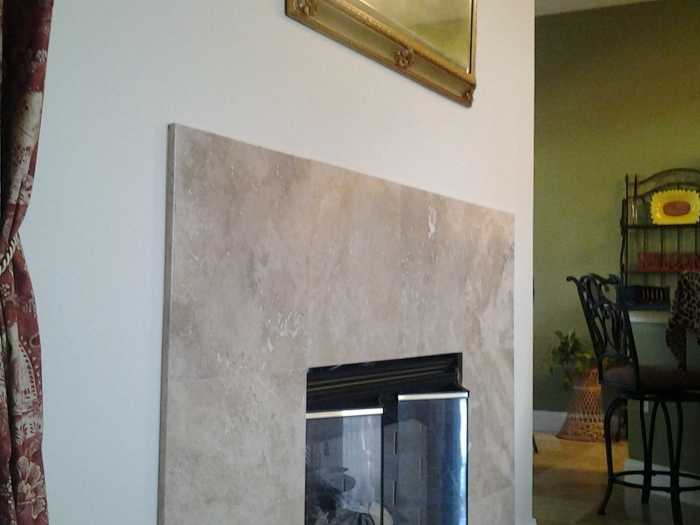 You can then apply the finish you want to get the exact look you want for your home and your fireplace. Does this come with any mounting hardware or the wall cleat? This doesn't come with mounting hardware, but it does come with a wall cleat. Do you have to put screws on top to secure it? And, is it made of MDF or all pine? The mantel is constructed of cabinetry grade hardwoods and is not constructed of pine or MDF. The mantel attaches via a wall cleat that is hung from the wall. You will need some masonry/drywall screws or fasteners to mount the wall cleat on your wall, then you will mount the mantel onto the cleat. Is the 72" the top of the mantel, or the tapered off bottom? The 72" is the top of the mantel. The bottom width is 68". What is the width and the depth of the bottom of the mantel? This mantel is 68" wide and gradually tapers down to 1" deep at the bottom. How do I hang this mantel? Does it come with brackets of some type? This mantel shelf will come with a wall cleat, but no hardware. You will need some masonry/drywall screws or fasteners to mount the wall cleat on your wall, then you will mount the mantel onto the cleat. For more information, please refer to the installation instructions by downloading the product manual on this page. Please note that link contains instructions to full mantels as well. Only the section about the mantel shelf will pertain to this item. Is the bottom width of this shelf 72" or is that the measurement for the top of the mantel? The width of this shelf is 72 inches across the top and tapers down to 68 inches along the bottom. What is the length of the bottom due to the taper? This product is approximately 4" in total depth and tapers to approximately 68" at the bottom of the shelf. I lightly sanded the top and applied two coats of white semi gloss paint to the mantel. Let it set for a day then mounted it above my fireplace. Everyone says it looks beautiful! Easy instillation as I read in other reviews. Very, very pleased with this purchase. Looking forward to doing more business with efireplacestore. If you compare it to other sites or even price the materials at a home improvement store, you will see you cannot beat the price on this attractive and well made mantel shelf. ProsLow price and high quality. This is a pretty good product. Mine arrived with a few dings that I had to use wood filler on before I painted it. But once I got that done and mounted it looks pretty good. Definitely worth the price so I can't complain too much.